An increased understanding of the genetic pathways involved in renal cell carcinoma has resulted in the development of various drugs that target relevant signaling cascades for the specific treatment of this disease. However, no validated predictive markers have been identified to guide the decision whether patients should receive vascular endothelial growth factor–targeted therapy or mammalian target of rapamycin–targeted therapy. We present what is, to the best of our knowledge, the first case of renal cell carcinoma in a patient with tuberous sclerosis complex who was successfully treated with everolimus. The patient was a 49-year-old Korean woman with tuberous sclerosis complex and recurrent renal cell carcinoma. The patient was treated with the tyrosine kinase inhibitor sunitinib followed by the mammalian target of rapamycin inhibitor everolimus. This treatment resulted in a prolonged response and significant clinical benefit. Notably, everolimus ameliorated the symptoms related not only to renal cell carcinoma but also to tuberous sclerosis complex. This case provides a rationale for the use of everolimus as first-line treatment for this specific patient population in order to target the correct pathway involved in carcinogenesis. Tuberous sclerosis complex (TSC) is an autosomal dominant disease that was first described by Bourneville in 1880 . TSC is characterized by hamartomatous lesions in various organs, such as the skin, retina, kidney, central nervous system, heart and lungs . TSC arises from genetic alterations in one of two genes: TSC1 (encoding hamartin) or TSC2 (encoding tuberin). Tumor cells taken from patients with TSC have been shown to exhibit active mammalian target of the rapamycin (mTOR) signaling, so mTOR inhibitors have been identified as potential therapeutic agents. In this report, we describe the case of a patient with TSC in whom TSC-related symptoms improved and a partial response to recurrent renal cell carcinoma (RCC) was achieved after treatment with the mTOR inhibitor everolimus. The findings of this case suggest that everolimus is an effective and appropriate treatment for patients with RCC related to TSC. In May 2009, a 49-year-old Korean woman presented with complaints of fever and left flank pain to our department. For the previous two decades, she had received regular medical care for TSC, which had been diagnosed on the basis of angiomyolipomas (AMLs) in the kidney and fibroadenoma on the face (Figure 1A). Her medical history included multiple episodes of seizures during infancy with no subsequent evidence of significant intellectual deficit. At the age of 40, the patient experienced spontaneous pneumothorax in her right lung. Chest computed tomography (CT) revealed multiple cystic lesions consistent with lymphangioleiomyomatosis (LAM) (Figure 1B). Additional systemic evaluations for clinical TSC manifestations revealed several cortical tubers (Figure 1C), multiple subependymal nodules (Figure 1D), a subependymal giant cell astrocytoma (SEGA) detected on brain magnetic resonance images (Figure 1E) and retinal hamartomas identified during ophthalmologic examinations. Echocardiography and endoscopy of the stomach and colon revealed no abnormal findings. The aforementioned clinical findings fulfill the four major diagnostic criteria for a diagnosis of TSC; thus the diagnosis was confirmed without genomic analysis. The patient’s family history was unremarkable before her daughter developed facial angiofibromatosis. Clinical features of tuberous sclerosis complex at diagnosis and after treatment with everolimus. (A) Photograph of the patient’s facial fibroadenoma. (B) Chest computed tomographic scan of multiple cystic lesions consistent with lymphangioleiomyomatosis. (C) through (J) Brain magnetic resonance imaging scans of the patient. (C) Cortical tubers. (D) Multiple subependymal nodules. (E) Subependymal giant cell astrocytoma. (F) through (J) Changes after treatment with everolimus. Abdominal sonography was performed to evaluate the patient’s fever and left flank pain, which revealed a newly developed mass alongside the AML in the left kidney. Because radiologic findings indicated the presence of renal clear cell carcinoma, we performed a radical left nephrectomy and diagnosed RCC on the basis of the histopathology. 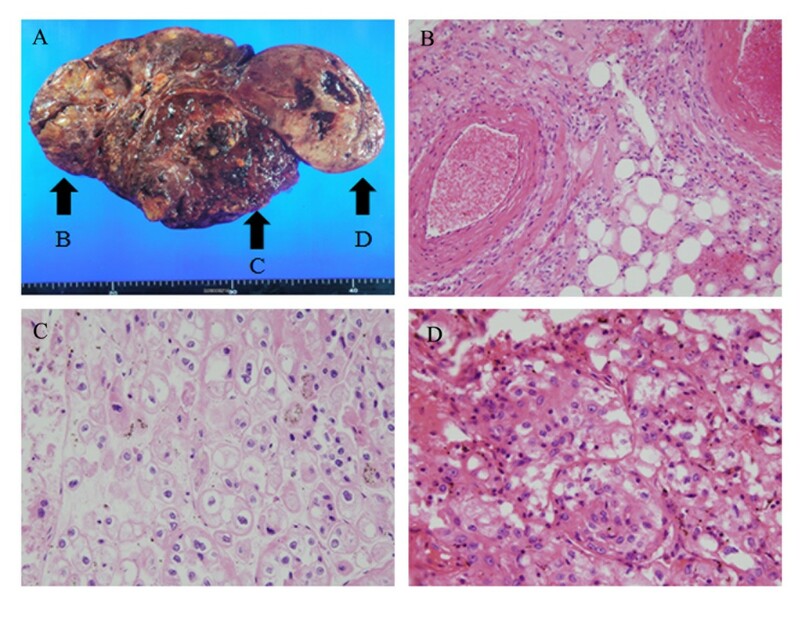 Pathologic examination revealed three kidney lesions (Figure 2A) of differing histologies (Figure 2A, arrow B: AML; arrow C: chromophobe RCC; arrow D: clear cell carcinoma). The final tumor node metastasis staging system classification was T3aN0M0, stage 3, Fuhrman nuclear grade 2. Renal mass shows different pathologies. (A) Photograph showing patient’s renal mass. Arrow B: AML; arrow C: chromophobe RCC; arrow D: clear cell carcinoma. (B) through (D) Histological tissue specimens showing AML (B), chromophobe renal cell carcinoma (C) clear cell carcinoma (D). Hematoxylin phloxine saffron stain; original magnification, 200×. In October 2010, approximately 17 months after the nephrectomy was performed, the patient experienced fever and left flank pain again. A follow-up CT scan revealed a heterogeneously enhanced mass at the nephrectomy site. A biopsy of the soft tissue in the left subphrenic area allowed us to confirm that this mass was recurrent RCC, and as a result a multidisciplinary team decided to administer systemic treatment for this unresectable and symptomatic disease. The first line of treatment included daily doses of sunitinib (50mg) for three months, which resulted in a partial response. However, recurrent grade 3 thrombocytopenia and stomatitis necessitated a 25% dose reduction. Additional dose reductions were necessary to address recurrent grade 2 hand-foot syndrome, whole-body folliculitis, grade 3 diarrhea and grade 2 hypothyroidism. After 13 months of sunitinib treatment, the lesion regrew and the patient’s pain recurred (Figure 3A and 3B). As second-line treatment, the patient was given oral everolimus (10mg/day) because it is approved for use in Korea for patients with recurrent RCC that is resistant to tyrosine kinase inhibitors (TKIs). Magnetic resonance images showing the treatment response of recurrent renal cell carcinoma and angiomyolipoma. 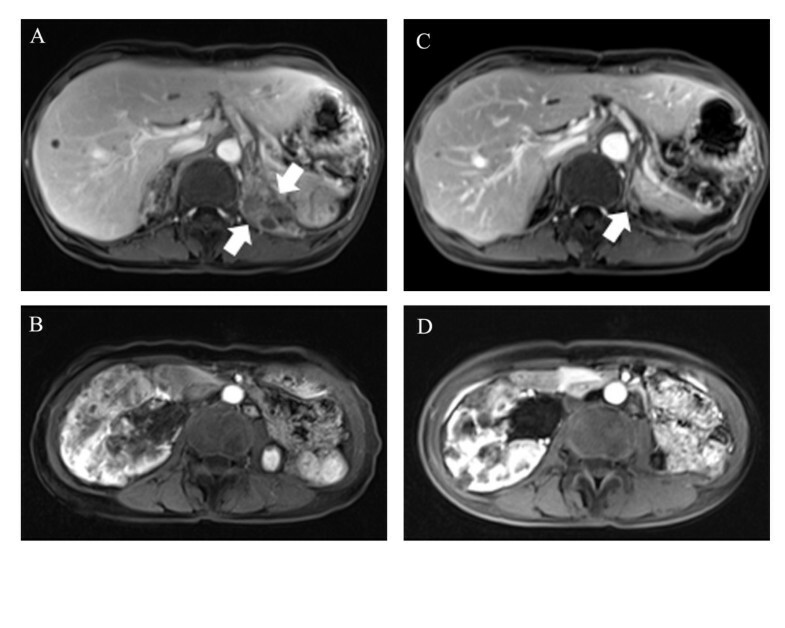 (A) Magnetic resonance imaging was used to produce this image showing recurrent renal cell carcinoma at the posterior aspect of left upper quadrant of abdomen (arrows). (B) Magnetic resonance imaging scan showing angiomyolipoma. (C) Magnetic resonance imaging scan showing partial response to everolimus treatment of renal cell carcinoma close to left diaphragm (arrow). (D) Imaging study showing regression of the patient’s angiomyolipoma. The patient reported complete resolution of pain after two months of everolimus treatment, and magnetic resonance imaging showed a partial response according to the Response Evaluation Criteria in Solid Tumours (RECIST 1.1)  (Figure 3C). Additionally, the patient’s facial fibroadenoma had remarkably regressed (Figure 1F), and, visualized on the follow-up images, the overall renal mass, including the AML lesion (Figure 3D), had decreased in size. Other asymptomatic benign lesions, including LAM (Figure 1G), cortical tubers (Figure 1H), subependymal nodules (Figure 1I) and SEGA (Figure 1J), had slightly improved. Adverse events were unremarkable with the exception of asymptomatic pneumonitis, which was observed in both basal lungs on the CT scan. As of December 2012, the patient’s treatment had achieved a partial response, and the patient was in stable condition and continued to receive treatment. Elucidation of the roles of vascular endothelial growth factor (VEGF) and mTOR-containing complex 1 (mTORC1) in RCC has led to evaluation of the use of VEGF and mTOR inhibitors for the treatment of RCC. Increased understanding of the phosphatidylinositol 3-kinase (PI3K)/Akt/mTOR pathway has resulted in the development of various drugs that specifically target this signaling cascade . Over the past decade, studies of these targeted agents have led to revolutionary changes in treatment options for patients with advanced RCC [1, 4–8]. However, no validated predictive markers have been identified to guide decisions about which type of therapy should be chosen (VEGF-targeted or mTOR-targeted) [9, 10]. Currently, the standard of care involves selection of the treatment regimen that is based solely on risk categories reflective of clinical parameters rather than on molecular pathogenesis. Several known genes are associated with kidney cancer. Two of these genes, TSC1 and TSC2, are downstream of AMPK and negatively regulate mTOR in response to cellular energy deficits. Germline mutations in either of these genes have been identified in patients with TSC, an autosomal dominant disorder associated with cutaneous angiofibromas, pulmonary lymphangiomyomatosis and renal tumors . Renal lesions, including AML cysts and RCC, occur in 60% to 80% of TSC patients with TSC [11, 12]. RCC has been reported in 1% to 4% of patients with TSC, which is a relatively low rate compared to that found in the whole general population. However, this type of cancer is typically diagnosed at a younger age in patients with TSC than in other patients with cancer. In a study group of patients with TSC, RCC developed at an average age of 28 years . Washecka and Hanna also found in their review that 43% of TSC patients with RCC had bilateral disease. Although clear cell RCC is the predominant malignant histological subtype, TSC-related RCC is unusual in that it is histologically heterogeneous. Oncocytomas, as well as clear cell, papillary and chromophobe carcinoma subtypes, have been reported in patients with TSC [12, 13]. Thus, the clinical course and prognosis of RCC associated with TSC are variable. In most cases, TSC arises from mutations that inactivate the TSC1 (hamartin) gene on chromosome 9 or the TSC2 (tuberin) gene on chromosome 16 [14–16]. Either of these mutations results in constitutive mTOR expression and impaired tumor suppression in multiple tissues [17, 18]. Consequently, the mTOR inhibitor rapamycin was evaluated in clinical, proof-of-principle trials. A total of 13 ongoing trials are being conducted to evaluate the efficacy of sirolimus, which is topical rapamycin, and everolimus, which is a rapamycin derivative, for treatment of various clinical TSC manifestations. Sirolimus treatment for either LAM of the lung  or AML of the kidney [19, 20] has enhanced disease control in a trial setting. Everolimus is currently licensed to treat patients who have advanced RCC and disease progression during or after treatment with VEGF-targeted therapy [6, 21]. Before it was used as an antineoplastic agent, everolimus was approved as a prophylactic agent for organ rejection in adult patients receiving allogeneic renal or cardiac transplants. Everolimus is a selective mTOR inhibitor that specifically targets mTORC1. The kinase activity of mTOR is activated mainly via the PI3K pathway. As mentioned above, several laboratory studies and case reports have suggested that mTOR inhibition leads to the shrinkage or stabilization of renal AML, LAM, facial angiofibroma and subependymal giant cell astrocytoma . Recently, everolimus was approved in the European Union and the United States for the treatment of patients with SEGA associated with TSC. This approval was based on the results of a phase II study . No evidence supports everolimus as first-line therapy over TKIs for patients with TSC as well as RCC. A case of a pediatric patient with RCC and TSC-related skin dermatofibrosis treated with sirolimus has been reported , but no data are available on everolimus as a treatment for RCC in adult patients with TSC. In this report, we describe the case of a patient who presented with RCC as a clinical manifestation of TSC. On the basis of the presence of TSC, the pathogenic mechanism that led to development of RCC in this patient was clearly defined. Despite our effective use of a TKI in accordance with treatment guidelines, the patient experienced a multitude of adverse events and her quality of life was significantly impaired during treatment. In contrast, second-line treatment with everolimus yielded significant clinical benefits evidenced by reductions in tumor size and other TSC manifestations, presumably because of inhibition of the most relevant RCC signaling target. Everolimus conferred these beneficial effects without detrimental adverse events and therefore did not compromise the patient’s quality of life. This observation provides a rationale for the use of everolimus as first-line treatment in this specific patient population to target the correct pathway involved in carcinogenesis. KHP was directly involved in the overall care of the patient, served as the lead clinician, selected the images presented and obtained written consent from the patient. STK, DJS, CHK, SWS, YHK, and WYC were involved in the patient’s treatment and investigation of data. HSK was directly involved in the overall care of the patient and drafted the manuscript. All authors read and approved the final manuscript.